Cast: Wesley Snipes, Jessica Biel, Ryan Reynolds, Dominic Purcell, Kris Kristofferson, Parker Posey. Directed by David S Goyer. Story: Half-vampire Blade takes on the final vampire conflict. The first Blade movie was cool. It was novel and stylish and as noir as a flambéd croissant. Blade 2, however, was a blatant cash-in and was a great disappointment, which usually would mark the end of the franchise. Surprisingly then, we find ourselves sitting in front of a third episode in the series, Blade: Trinity. Expectations are low. Blade: Trinity assumes a certain familiarity with the scenario, so I'll recap briefly. Set approximately in the present day, vampires stalk the earth preying on humans and remaining undetected by the authorities. 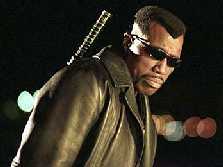 Blade (Wesley Snipes), a half-human, half-vampire, is the humans' greatest weapon in the struggle between the species - but being half-vampire, Blade must take doses of the "serum" to suppress the bloodlust. When killed by the traditional silver bullet (or sword, arrow or pretty much anything silver), a vampire disappears in a cloud of ash. Vampires also disintegrate in sunlight, but Blade is immune to this effect, giving him the name "Daywalker" within the vampire community. Blade is assisted in his crusade by long-time human buddy Whistler (Kris Kristofferson), who always seems to be caught and tortured (poor old duffer). This time around the vampires need a little help, so they've dug up the original Count Dracula (Dominic Purcell), who can also move around in daylight. The explanation for this is, "I'm the first of my kind - I'm unique." Cheers then, that clears that one up. Along the way, Blade teams up with the "Nightstalkers", a band of human vigilantes headed by Jessica Biel and Ryan Reynolds and they set about Dracula (or Drake, as they've decided to call him now). The story is, as expected, complete balderdash. The movie is an excuse to string together a series of wisecracks and set pieces while cashing in on the success of the original stylish episode. Ryan Reynolds has by far the best lines and manages to raise a few laughs, the best of which is, when surrounded by a group of vampires, "I've eaten a lot of garlic today, and I've just farted." This is the level we're talking about here, which is epitomised by Parker Posey's vampish vampire, played exactly like a high school goth. It's pretty clear who this is aimed at - American high school kids. Run around with guns, pose and look cool, sneer and rebel against authority. It's the latterday equivalent of Arnie's Commando way back in 1985, though dare I say it, even less convincing. There are a few saving graces. The atmosphere is suitably dark and brooding, and Wesley Snipes, even when he looks bored out of his skull as he does here, is always watchable. Ryan Reynolds adds some desperately needed humour to an otherwise soulless script and Kris Kristofferson adds weight, though he is given far too little screen time. The anti-vampire weapons are cool in a silly-but-fun kind of way, and the trick at the very end (which I won't spoil) is actually quite clever. This isn't enough, unfortunately, to cover the risible wire-work, the uninspired combat scenes and the fact that Jessica Biel looks like a schoolgirl flapping through her first karate lesson. Übervampire Dominic Purcell has some nice sneery moments but just doesn't have the presence to pull off a patriarch figure. I was reminded of the scene in Father Ted where Ted tells Dougal that the "lad in the hat" that he'd met in Rome was the Pope. "That was the Pope?" exclaims Dougal, "you'd think he'd be taller." Testosterone Satisfaction Rating: 5/5 Designed for adolescent boys, with all the cool outfits, wisecracks, weapons and fantasy violence. To enjoy this film you should: think like a teen.